When I was growing up in 1950s Queens, we always had a real Christmas tree. I’m not sure why we never had an artificial one; it may have had to do with the fact that fake trees just looked so fake back then. But I think the primary reason was that every year, in mid-December, the empty corner lot near our house turned into a mini-forest of pre-cut conifers piled against the cyclone fencing. We didn’t have a car, so a tree lot we could walk to was a gift we weren’t going to refuse. So every year, on an icy evening (for some reason I remember it always being below freezing) about a week before Christmas, my father, sister and I would bundle up and walk the two blocks to 84th Street to pick out our Christmas tree. We took it seriously; tree after tree was grabbed, shaken out, and held upright while we eyed it critically. Eventually we'd find one that was absolutely perfect! (i.e., we were starting to get really cold) and my father would shoulder it (which gives you an idea of its size) and carry it home while the two of us danced around him. We'd get it home, saw a few inches off its skinny trunk,* and set it up in our front parlor in a stand that, in retrospect, was ridiculously small and flimsy. Decorating it was a ritual. First, colored lights. At first they were the big, hot, beautiful, teardrop-shaped glass bulbs; mini-lights came later. Then the garland. Then the ornaments, which went on in no particular order except for the last two -- our baby ornaments, which we put on last. We were allowed to take them out of their special boxes and hang them all by ourselves despite their fragility, always in the same spot, and always with the admonition "Be careful!" Last, the tinsel. That godawful, dangerous, messy, lead tinsel. But we couldn’t imagine not using it. And that was our Christmas tree. It was small, it was unpretentious, it was frequently unkempt and unshaped. We didn’t know or care; it was beautiful. And it instilled in me the conviction that a live tree is the only kind of Christmas tree I’d ever have. 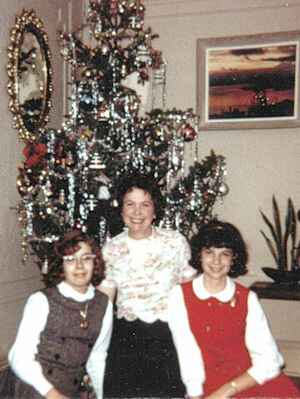 Me, my mother, and my sister in front of our normal, sensible tree in Queens, NY, in 1964. Notice all the vintage Shiny Brite ornaments! Years later (but still years ago), I was living in the Bronx. My future husband and I decided to visit a tree farm and cut our own, so we drove up past Peekskill to a place we'd heard about. We needed one for my apartment and one for his house. Simple. Not. This was our first experience with buying a tree "in the field" and we didn't realize the tricks of perspective this can play. We picked out our trees and dragged them back to the car. They were beautiful: vibrant, full, perfectly shaped… and gigantic. The tree farm had a baling machine (this was the first time I'd ever seen one. All other Christmas trees in my experience had needed no more than a few turns of twine to keep them compact), but the attendants there just laughed at us. There was no way those trees were going through that machine, so up on the car roof they went. As we drove back home, we noticed other drivers and passersby pointing and laughing. We were puzzled till we went through downtown Peekskill and caught our reflection in a store window... and we understood that we looked like we were carrying a forest on our car. The full extent of our problem did not became evident until we got them home. Mine barely fit in the elevator, and when we tried to jam it into my wimpy tree stand, I swear I heard it snickering. We rushed out and bought a better stand and, after much struggling and a great deal of language that was not in the spirit of the season, we were able to set it up. When my fiance got his tree home, he ended up cutting off at least two feet off the bottom to get to a point where the trunk was narrow enough to fit his stand. But the ceiling was still quite a bit lower than the tree, so rather than cutting more off the bottom and refitting it into the stand, he pruned from the top. The result was a tree that fit into the living room – wait, did I say “fit into”? I meant “completely filled” – but he had cut off all the tapering parts so he ended up with a Christmas tree shaped like a cylinder. It was actually a pretty interesting look. We were slow learners. For years afterward we kept doing the same thing. We’d drive home, tree on the car roof and hearts in our mouths, watching as strands of taut heavy twine ominously loosened, one by one; we’d leave a quarter of a tree’s needles on the porch as we forced it through the front door; we’d get it all set up and trimmed only to find, next morning, that it had gone horizontal some time during the night. 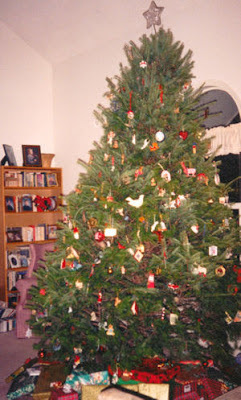 But we did learn a few things over the years: first, to buy the biggest, sturdiest tree stand available; second, to anchor the tree to the wall with 50-lb fishing line and a staple gun; third, to wait at least a day to let the tree settle before we started to trim it. We've learned to live with the little extras that come with farm trees: birds' nests, cocoons, mantis egg cases, even the spider egg sacs that hatch inside the warm house. I tell myself it just means we’re not bringing heavily-sprayed trees and pesticide residue into the house. And we learned that in spite of everything, when all is said and done, giant Christmas trees look WONDERFUL. * Every year, we’d add that 4” piece of trunk to the “wood” in our artificial fireplace. You will not consider this weird if you grew up in 1950s Queens. No, we did not have clear plastic slipcovers. Sheesh. · ALWAYS call first for hours, obviously. But ask about cost, too. They can be pricey. · Decide before you go how tall your tree should be, and how wide your tree stand is. Then measure your tree’s height and trunk diameter before you cut. · Some farms let you tag a tree and come back later. But beware: there are nasty people out there who will tear off your tag and take your tree! · Some farms allow you to wander the area with a saw; others prefer to cut the tree for you. Chainsaws and axes are generally taboo. · Be respectful: if you cut it, or even just start to cut it -- buy it. Don’t leave a tree lying on the ground because you noticed something better. · Most but not all farms have baling machines and people to help you load the tree on your car. If this is important to you, ask first (and bring some extra cash for a tip!). Otherwise, be prepared to load your tree on your own. Oh, and make sure the attendant doesn’t tie your car doors shut… yes, this has happened to us. … or something similar. You get the idea. Once you’ve brought your cut tree home, how do you care for it?